I'm going off on a design tangent for a DW SUP. Basic approach is a short narrow flat water style shape to get to a launch speed to start pumping. The other hope is to prevent splashing water out front, which I'm guessing isn't helping forward propulsion! Cool! A friend and I got some "cheap" EPS and have now been embarking on a fun learning experience of cutting foam, shaping, glassing, etc. I am intimidated by the artistry involved in surfboard shaping, but we are making big fat barges with a lot of straight lines. More or less copying the designs of Kalama and Supfoilmachines, but uglier. 6'x28"x5.5". Deep chines with hard lines and vertical rails ... the principle (supposedly) is that they will help the small board track straight, more or less like a boat hull. Is that kind of what you have in mind? Buddy's got his glassed, seems to be working, though initial testing sounds like more nose rocker may be in order to help avoid nose pearls. In my view you will need a Vee nose just like the down wind SUPs. Just like boat hull designs that are meant for speed. The only main problem is touch downs. You will nose dive deep. Lol! Post-edit added some photos off a desktop - couldn't do it from my iphone, but just worked out you have to rotate the phone to landscape to get access to the save button! Anyway will let out know in a few weeks (if the wind blows) how it goes. The M280 hands you a bag of stability which is why I've gone nervously narrow, but no idea if the balance point will be paddle-able. Bonding the boxes to stringers involves locking them at 90mm apart using 1/2 inch wood block. 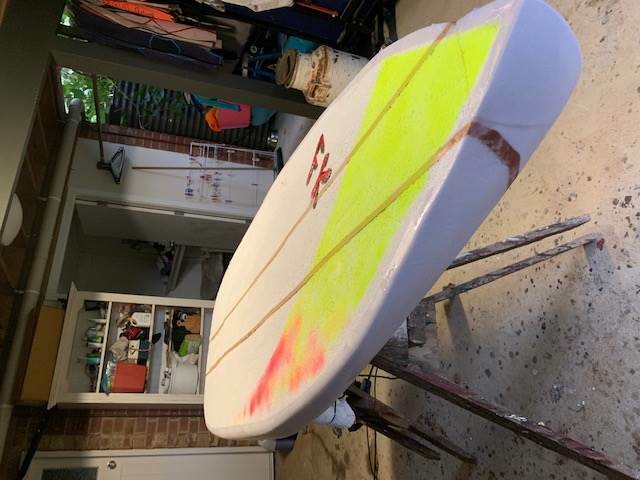 I can send some better photos of that if your interested - done it for my prone board, and it's survived a few months out at Foil Bay. Very interesting, and thanks for sharing your experiments! Nicely done! I like the DIY go for it attitude. I have never done a downwinder (too busy kiting when it's windy), but always thought that some fabric between legs and arms could act as a sail to help give some forward push. Now Kai Lenny's wingsuit video shows it to be true. May be a worth a try! Love the idea of the wingsuit - at least you don't need to be concerned about how you look. I've done a couple of team M2Os, and always joked about wearing a huge sombrero, so one of those novelty umbrella hats. I'm out of the water for a week so no doubt it will blow like stink. Ironically after the grief I get from my surfing buddies about the self-harm danger of foiling, I managed to punch a barnacle 10mm into my foot during a surfing rock-off. You'll loose a lot more stability from a pointy nose compared to a chimed rail . 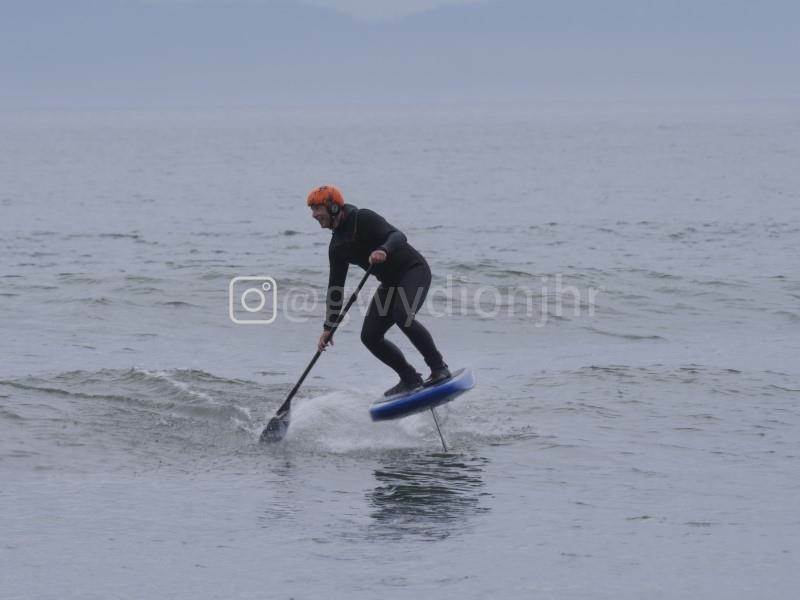 You only need to look back past 12 months on Sup Foil Dwer's to see the noses are now very full and squarer and shorter boards compared to a year ago , this because you are pushing off the nose off the back of the swell as it rolls through to get the board up on the foil. You don't go paddling your guts out in front of the trough trying to pick up speed to get up on the foil. Jacko or someone else might explain this better in more detail . 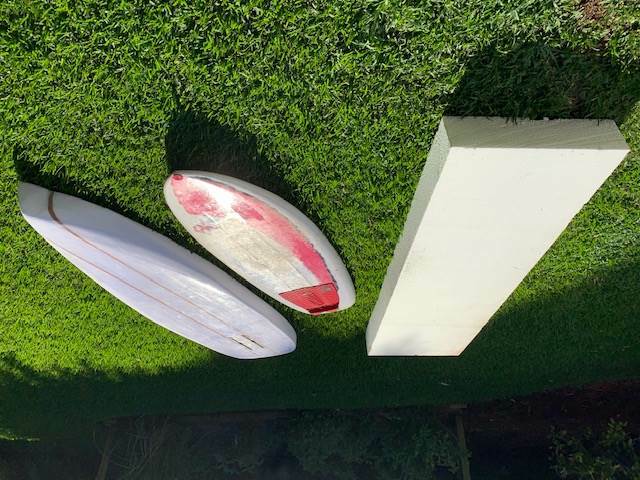 The one huge downside of squarer fatter noses is these are hard to paddle back when the wind dies The chimed rails play a big part in helping release the board from the water and bouncing back up on touch downs. Your board will still definitely work though and looks good , just pointing out latest changes and really like the way you have bonded to the boxes to the stringers. Probably should have mentioned I normally downwind on One of Jacko's immaculate boards, the 6'8. Once I get the stitches out of my foot I'll let you know if nose lift, chines and tail rocker make a difference when you've got none of them!! Hi mate. Just as a matter of interest, how do you like the one board for down winders? Really enjoying the One board - it's damn light for the 109l volume, nicely positioned tuttle box mounts the GoFoil perfectly (I'm OCD on waterflow: I tape over the boxes...) and picks up runners without any surprises once you're keyed into the surf stance/pump regime. 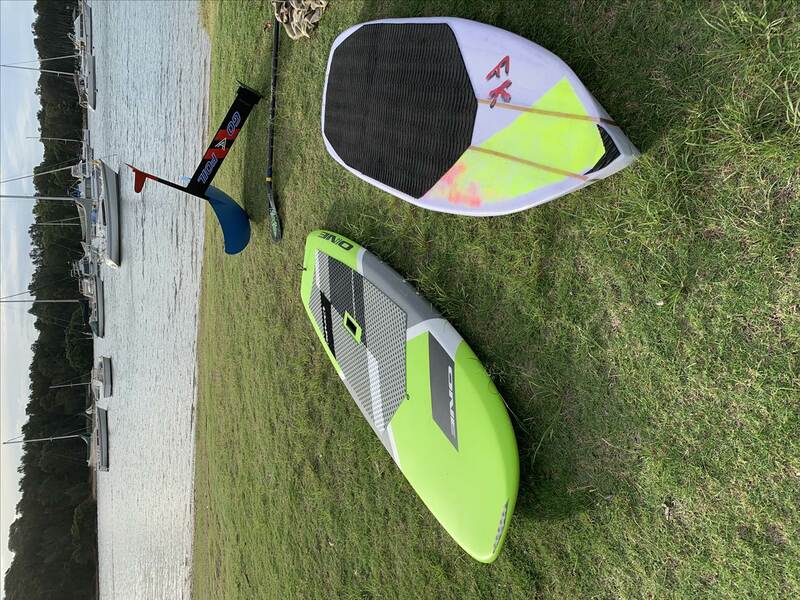 Sorry to be a little off subject,I'm a newbie sup foiler,everything I read says feet should be centered over stringer,these photos different feet setup??? Juan that board looks great! 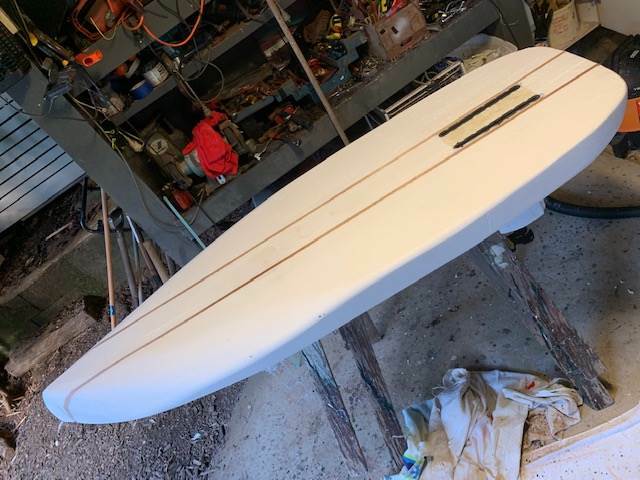 Great thing about foiling is it lets us amateur shapers loose, since the goal is getting the board above water, so all those vees and concaves and templates you've sweated don't matter nearly as much. The tough bit is mounting such a monster fin! I posted a reply with a couple shameless self promotion photos of myself, either I didn't post it right or it got removed. So this time a reply with no photos. Those pics are my friend ... not sure if it is just that wave or his stance is unusual, never noticed that before. I checked my pics -- stance is directly along the stringer, surfboard style. I have seen discussion of some sup foilers who have front foot offset though, like a windsurf board. Pics of the prone board? SUP foil: an homage to Kalama and Surffoilmachines out of Florida. www.supsurfmachines.com/ Scroll down to his explanations for flat rails, deep chines, straight tails, and limited rocker -- make sense to me, seems to be a market standard, and best of all, straight lines = easy for a newb doofus. I am going for 6x28x5.75. Slightly rounded nose, square tail. Surf foil: aiming for same design principles. I got photos of all the ones I could find online, blew them up and took measurements. I went mostly with the Amundson Nubby, with a nod to WCFC (really like the new slingshot, but too tricked out to aim for). 5x20x3. Flat deck, though I added 0.75" nose rocker with an after-market glued on shim of foam. Flat bottom with a nose kick starting about a foot back, tail kick from 5" back, just after mast boxes. I went with rounded nose and tail, though if I did it again I think I'd leave the tail more square. I went with 3" chines to 1.5" height. Will leave the edges hard, round off the deck edges. My buddies sup foil, with a similar design, is working ... so I am pretty sure mine will too. 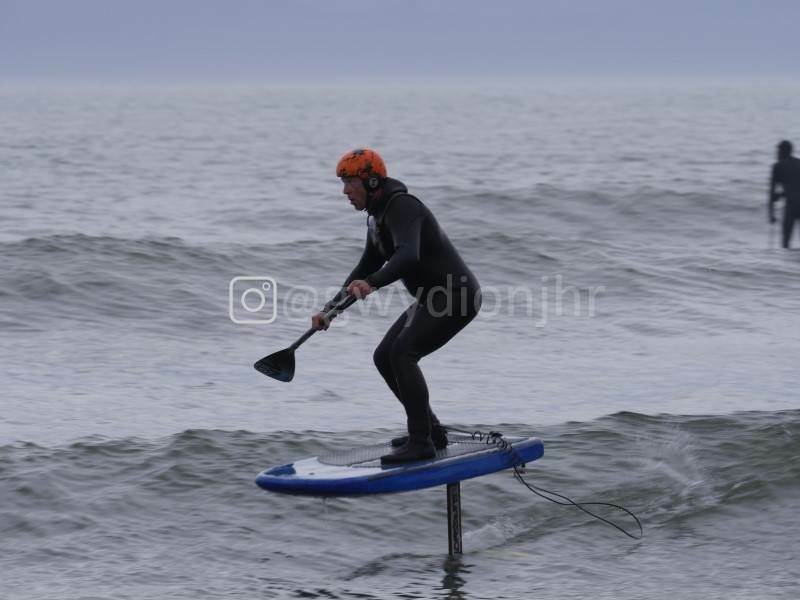 Hope the surf foil works too! I've only tried once....a lot going on there, going to need a concerted effort to get it figured out. Part of which will involve learning to catch waves on a shortboard again, after years of longboard and sup laziness. 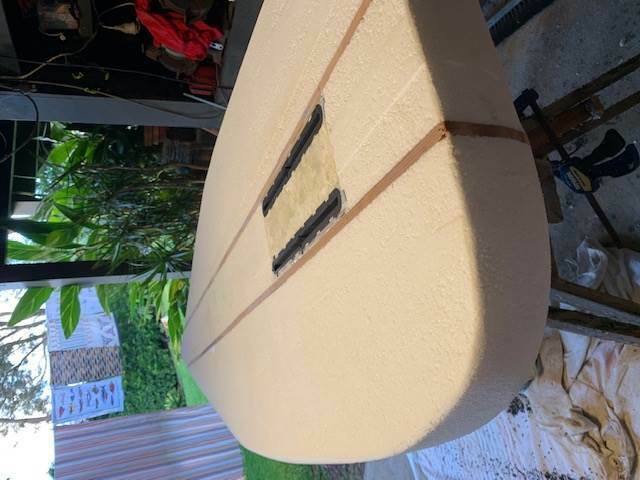 Here's my prone board, 4'10 x 20.5 x3 which based on no more science than my chest waterline is probably just south of 40l. 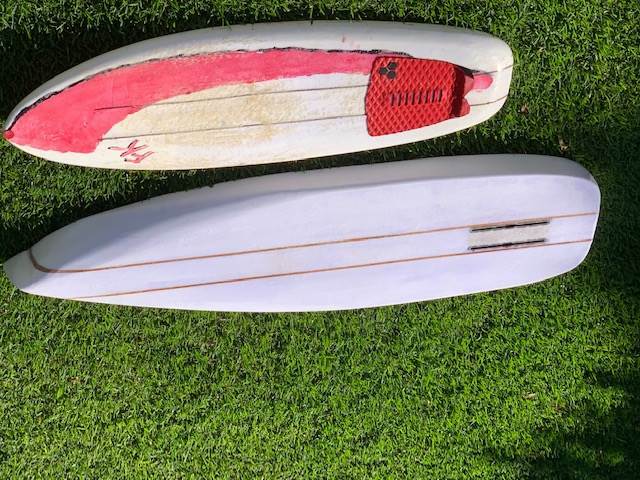 I think Kai with Naish started with this shape of board but a lot longer. 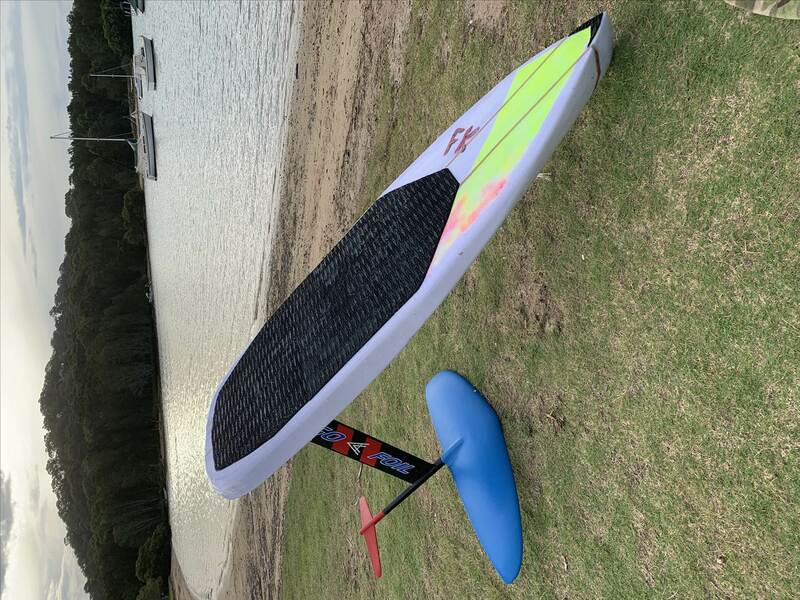 - feet a bit apart from the stringer are much more comfortable to paddle for take off, more balance, and shoulders facing forwards for paddling power. I have not enough experience yet to know what is the best compromise with straps. I like the setting I have now with the front foot about 2" away from a purely centered-on-the stringer position: It eases a lot my paddling but does not seem to be too much of a problem in the air. But I cannot say if it is the ultimate best one. Without straps, I guess it is a moot point, as you can paddle and fly with different feet position. Funny to see that Signature Pegasus board JEG - that's pretty much what I was thinking, just wanted to take it to the shortest and narrowest version possible. I've gone out twice now (the barnacle biopsy is still giving me hell on the ball of my foot) unfortunately in marginal conditions. One evening in about 10-12 kts - no take offs, finished in complete darkness trying to line up Newport reef by street lights. 2nd time decided maybe I could prone paddle it fast enough as it's got some amazing glide. Unfortunately the dying Southerly meant not a whitehorse in sight. BUT near the end of a fruitless DWr near some rock ledges and knee paddling, a runner stood up on a bombie enough to launch. Had the pleasure of flying past my bored, prone paddling buddy on a 12' Bark yelling something stupidly triumphant, pumped off through Crossies and hit a rock. Literal salt in the wound was the wing hit me in the shin for some more blood loss.